Like corn on the cob? Too hard to do at a tailgate? Maybe not. 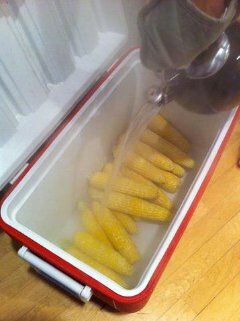 Here's a simple method for cooking loads of corn on the cob perfectly for the tailgate crowd. To make this truly Maize & Blue, whip butter with blue cheese and let your guests brush it liberally on the corn. Yum!